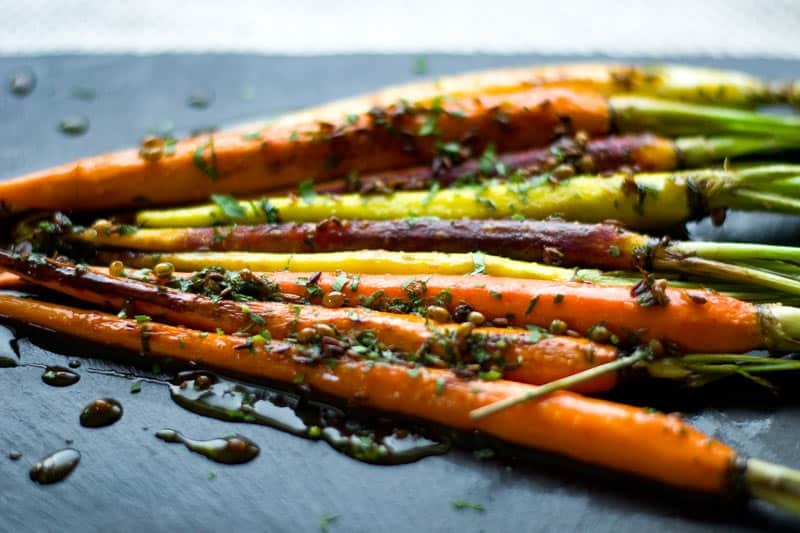 Lovely and delicate rainbow carrots spice up for the season with a brown sugar glaze spiced with cumin, coriander and tarragon. When most people think of Autumn, Pumpkin Spice comes to mind. But for me, it’s all about spiced brown sugar… on everything. And a bunch of gorgeous rainbow carrots is divine for a good drenching of a brown sugar spiked with cumin, coriander, and tarragon. 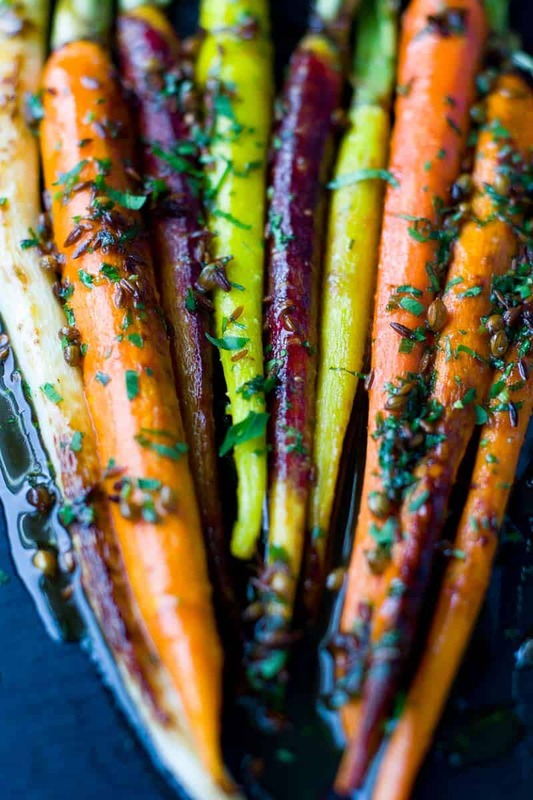 Our Roasted Brown Sugar Carrots are both delectably sweet, with a lovely layer of aromatics. 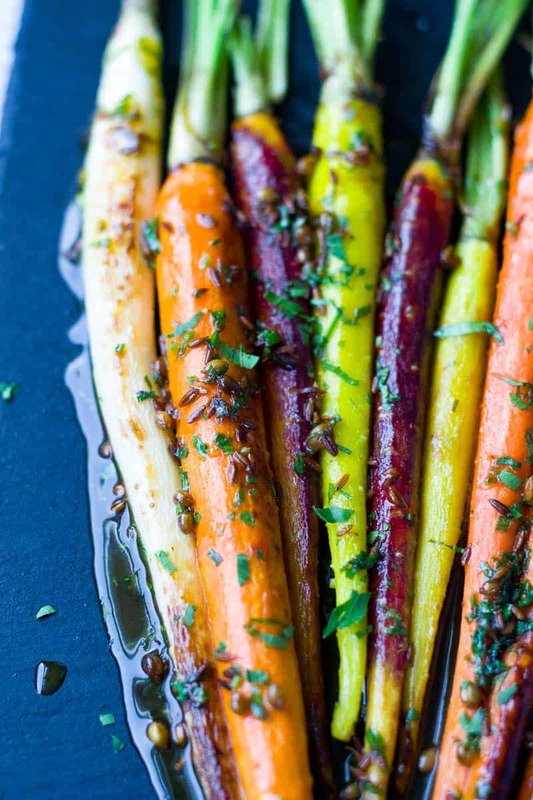 The glaze is butter and orange juice-based which gives the rainbow carrots a full tangy feel, while the addition of the brown sugar imparts a satisfying crunch when well-roasted. Always buy carrots with the green tops on. It preserves the overall freshness of the carrot. The greens should be bright and springy. Avoid carrots with any soft spots, they should be firm all around and not too easy to bend. The surface should be smooth to the touch. If you want to serve the rainbow carrots with their green tops, be sure to do so within or a day or two, at most. Don’t buy if there is an overgrowth of excessive hairs or any splits or cracks. It’s challenging to freeze cooked carrots as they turn to mush if left to thaw. So you can either store leftover roasted brown sugar carrots in a plastic container and refrigerate for, at most, a few days. If you want to freeze the carrots, wrap them in foil and place in a freezer bag. When serving again roast the frozen carrots immediately or use them in a soup or stew. If you’re serving these carrots during Thanksgiving, you can pair them with another fab dish from Vintage Kitty – Brown Sugar Date Roast Turkey. I’m sensing a trend, aren’t you? Tenderly roasted rainbow carrots with brown sugar spiced glaze. Wash, trim and peel two bunches rainbow carrots, pat dry and set aside. Using a large heavy bottom saute pan over high heat, add grapeseed oil, wait until smoking hot. Carefully add six small or four medium carrots at a time, sear until you see light caramelization on all sides. Remove from pan and set aside using a folded paper towel. Once all carrots are roasted and set aside, clean pan with paper towel and turn heat to medium-low. Next, add both cumin seeds and coriander seeds to dry pan and toast until aromatic. About three minutes. Add orange juice, light brown sugar, and Kosher salt. Reduce on medium heat for three minutes then add carrots. Continue to reduce until orange juice has a nappe consistency. Turn off heat. Mount in butter, tarragon, and parsley. (Be sure to gently swirl pan around while mounting butter). Place carrots in roasting pan and drizzle on brown sugar glaze. Roast in oven at 350 degrees for 10 minutes or until glaze starts to caramelize. 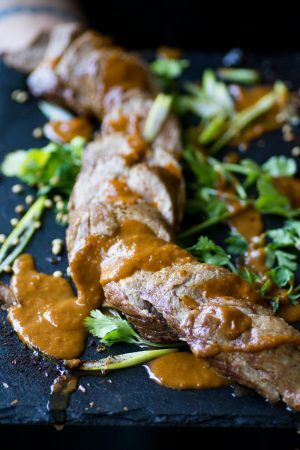 Really like both the recipe and the website! Awesome job! What a great recipe! Love how simple these are – they would pair well with so many things! I have to make these. My daughter loves brown sugar carrots, and I love your take with the orange juice, and additional spices! What a beautiful side! I love the colors and spices. Rainbow carrots are so pretty. The sauce sounds amazing. I have one daughter that will not eat carrots. Perhaps if I top them with sugar I might just be able to convince her to at least try them. It worked with our youngest son (age four). I think the colors distracted him long enough to try and after one bite – no more complaints! These look so delicious! I love how fancy they look, too! I’ll have to add this to a dinner soon! Those carrots are gorgeous and I love your brown sugar spice mix! I can think of all sorts of things to use that brown sugar on! Try it on sweet potatoes if you get a chance. OMG, so good. I love these carrots! Not only they look beautiful but love the brown sugar and spices you used. Definitely a great side dish for fall! I love roasting carrots. SO much more sweeter. I usually add honey but i’m loving the brown sugar and spices you have going here. So warm and perfect for today’s rainy day too! What pretty carrots these are! I love carrots and make them all the time. I think they are such a great veggie! Thanks for the new recipe to try! I love the use of multi coloured carrots. 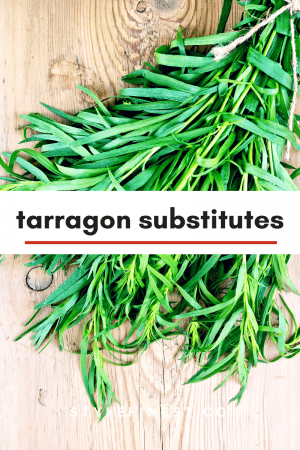 Tarragon is such a special herb isn’t it. It gives such a unique flavour. Your carrots are so very pretty! I love the colors. 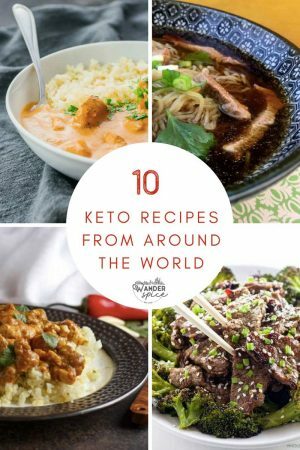 They would certainly add a nice touch to a plate and the flavors you use with them sound delicious. We certainly like our carrots but the way you’ve made them is even more appealing. They look so beautiful that I just by seeing them I want to eat. Definitely a great way to include vegetables in kids meal. Love the brown sugar and all the spices and the orange juice is a great idea to add some acid to the carrots. So, I’m pretty sure I’m going to have to make these as a side dish for Thanksgiving because they look TOO amazing not to make! YUM! 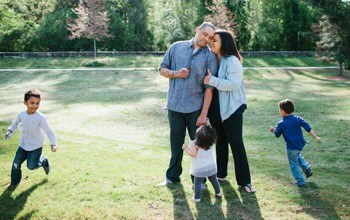 Your photos are gorgeous, too! This is a fab way to cook carrots! 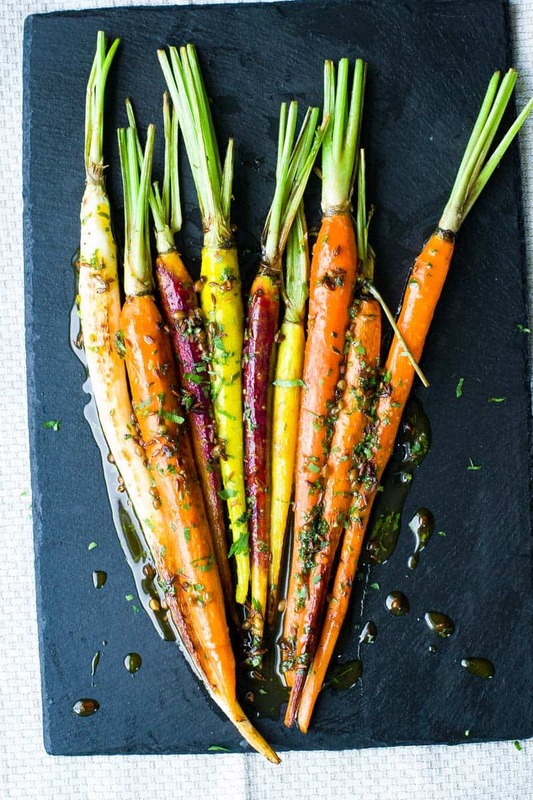 I am so pinning this…bet my carrot hating kids will eat these! These are not only delicious but also colorful I am love with it. You I am in look for these colored carrots for long time. Your recipe sounds delicious.